Historica Canada is proud to share a new Heritage Minute celebrating a Canadian civil rights icon. Businesswoman Viola Desmond courageously fought racial segregation in Nova Scotia in the 1940s after she was arrested while sitting in a movie theatre section reserved for white patrons. Though her legal challenge was unsuccessful, the case became a catalyst for change. She was posthumously pardoned in 2010 by Nova Scotia Lieutenant-Governor Mayann Francis. Viola Desmond’s spirit and vision for justice lives on. Learn more about her story on The Canadian Encyclopedia. 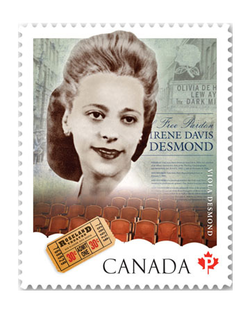 ​ Stay tuned for the launch of our new Viola Desmond Heritage Minute in February 2016.